Less than a month after approving the proposal at Annual Conference, Bishop Leeland, the Board of Trustees, leaders of the conference and conference staff gathered at the property in Huntersville to break ground for the new conference office. 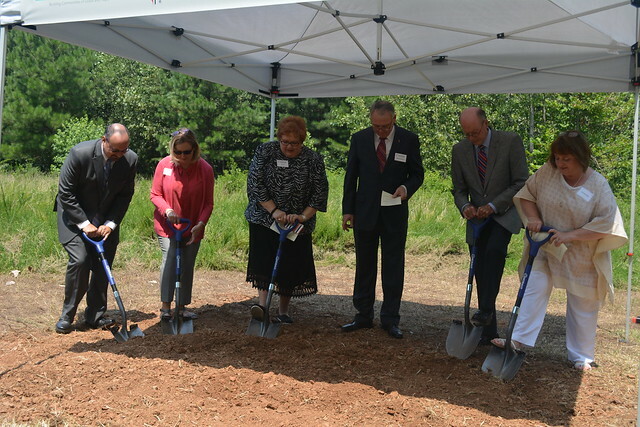 The service for breaking ground was held at 12 Noon on Saturday, July 22, 2017 in land adjacent to the United Methodist Foundation of Western North Carolina (13816 Professional Center Drive, Huntersville, NC). Bob Wilhoit, chair of the Board of Trustees, welcomed everyone to the site of the new facilities, he remarked, "The new conference center will be a cornerstone to enable us to better coordinate our many resources to achieve our mission and ministry as an annual conference." He introduced Roy Helm, Jr., President of Wesley Community Development Corporation. Wesley CDC will manage the construction of the project because of their experience with construction of numerous facilities across the state. Their offices are in the UM Foundation building next door. Rev. Donald Jenkins, chair of the Board of Ordained Ministry led the group in an opening prayer, followed by scripture readings. Rev. Glen Kinken, chair of Council on Finance and Administration read Genesis 28:11-22. Rev. Amy Coles, assistant to the bishop, read Matthew 16:13-18. Bishop Paul Leeland led a litany of breaking the ground. During each section of the litany followed by the refrain: “We break this ground today”, a different group of participants turned the earth. The service closed with a prayer of consecration led by Jane Wood, chair of the Board of Laity, followed by the entire group reciting The Lord’s Prayer. A benediction was offered by Mark King, conference treasurer, who said this, "This day is about more than just erecting a building; it is about the faith and hope of our annual conference to see beyond our generation and build for the present and the future." He continues, "As I relayed in the benediction I offered, Now to the Lord who is able to immeasurably more than all we ask or imagine, according the power that is at work within us, I firmly believe God is at work among us." Lunch followed at the Foundation.